I absolutely love, love cinnamon rolls! 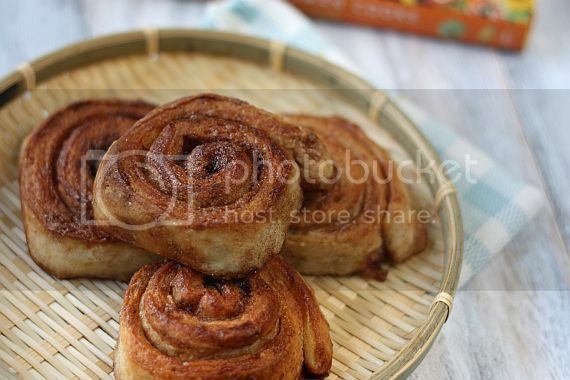 I remember the first cinnamon store that opened in Singapore about 18 or so years ago and there were long queques lining up the store front just to grab the rolls. I believe the store's name was Saint Cinnamon and it was located at Wisma Atria. As I am a born sucker for cinnamon rolls (and still am), I too joined the long queques. I would usually take away about 3 to 4 rolls to munch on during tea break or breakfast. 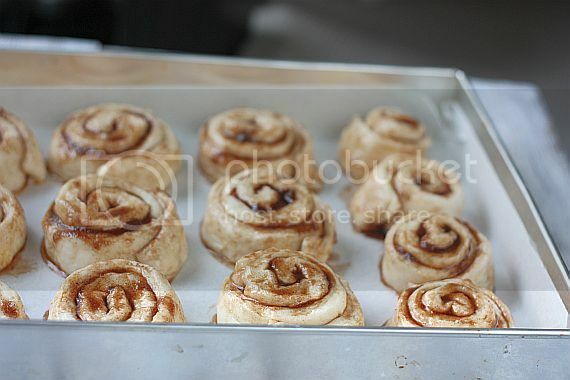 Gosh the smell of freshly baking cinnamon rolls could entice any hungry soul that's for sure. You could say that I have tried a few Cinnamon Roll recipes in my brief baking history. You will find one such posted recipe in this blog as well from my early blogging days. However I can swear that this particular recipe from The Pioneer Woman beats everything else hands-down. I love this recipe! So much so that this is my fourth time making these rolls. This is definitely a recipe for "keeps" in my book. Recipe Adapted from "The Pioneer Woman Cooks"
1) Mix the milk, vegetable oil and sugar in a pan. 2) Scald the mixture (heat until just before the boiling point). Turn off heat and leave to cool for about 30 mins. 3) When the mixture is lukewarm to warm, but NOT hot, sprinkle in dry yeast. Let this sit for a minute. 5) Add in 1/3 cup of flour, baking powder, baking soda and salt. Stir mixture together. (At this point the dough will still be sticky, you could cover the dough and put it in the fridge for about 30 minutes to firm slightly so that it'll be easier to handle. Alternatively you can leave it overnight or even a day or two in the fridge. This will give you a firmer dough. Just keep your eye on it and if it starts to overflow out of the pan, just punch it down). 6) When ready to prepare rolls, mix the sugar, cinnamon, nutmeg, mixed spice and clove in a bowl. Stir well to mix everything together. 8) Now starting at the opposite end, begin rolling the dough in a neat line toward you. Keep the roll relatively tight as you go. Next, pinch the seam of the roll to seal it. 9) Cut the roll to approximately 1 inch thick and lay them in a greased baking tray. Leave a little space in between the rolls for them to rise. Let the rolls rise for 30 - 40 mins. Then bake at a 180℃ pre-heated oven until light golden brown, about 20-25 mins. Serve warm. You are so right! Definitely a keeper for this one! beautiful. 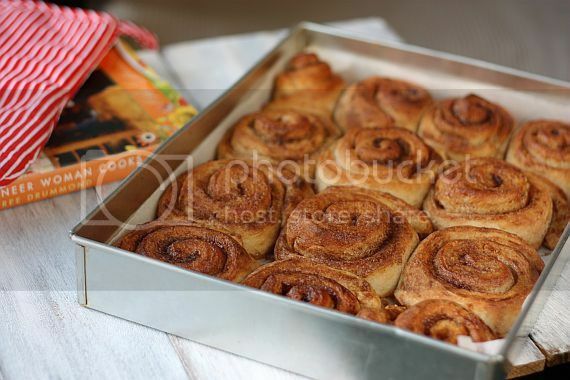 I am abig fan of cinnamon rolls! so beautiful and professional looking. I love cinnamon anything. Oh yum yum! Since so many of u ladies justify this is good, then must try this weekend! Tks Jo! wow you've baked these 4 times now, that surely is a recommendation so I'm off to bake these for myself. I can smell them! Great pics and thanks for the recipe! 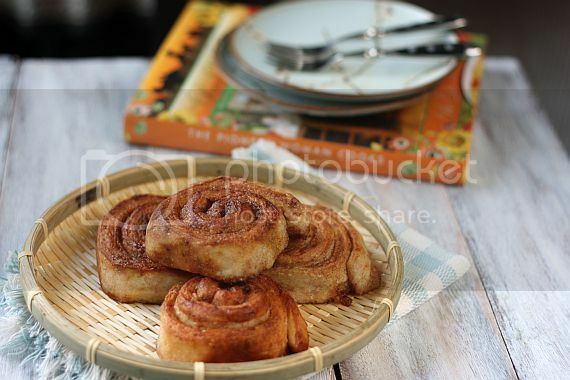 Cinnamon rolls fever! Love these! Yes, i remembered the shop at wisma atria but then I was a poor student so can't afford to eat it that often. Will book mark your recipe, they sure look good! My hubby hates it, but I love it. I'm glad my girls love it too. I've heard so many raving about this recipe, should try it one day. Almost everyone is baking this and raving about it! Looks like I'll have to try this too! You've added nutmeg to it, I'm sure it'll be fantastic! 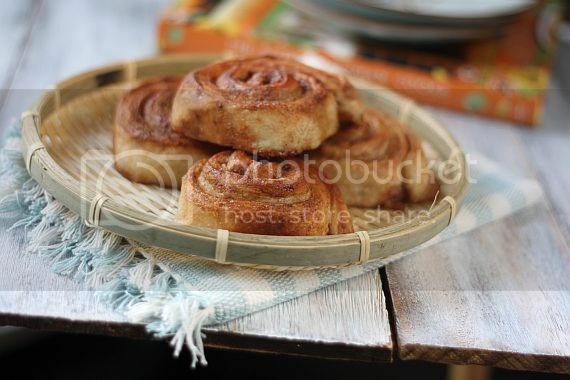 Wow Jo, these look fabulous and packed full of cinnamon. Yum. Did you really use 3.5 tablespoons of cinnamon?